Applying the proper amount of clamp load to a rod bolt is perhaps the most crucial operation in assembling an engine. Too much or too little torque can lead to engine failure. Measuring bolt stretch provides a 100% reliable method of getting the correct clamping load. ARP has taken accuracy to the next level with the introduction of a digital stretch gauge that measures to the ten-thousandth (0.0001″). 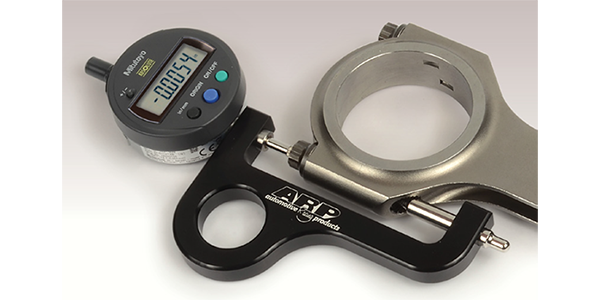 ARP’s new digital rod bolt stretch gauge has many important features, not the least of which is an easy-to-read digital display. Accurate readings are ensured through opposing ball and pin-type probes which center on the bolt. A uniquely designed billet aluminum handle makes for ease of operation. Carrying ARP’s part number 100-9943, the digital rod bolt stretch gauge comes in a handy carrying case and is an important addition to any engine builder’s toolbox.